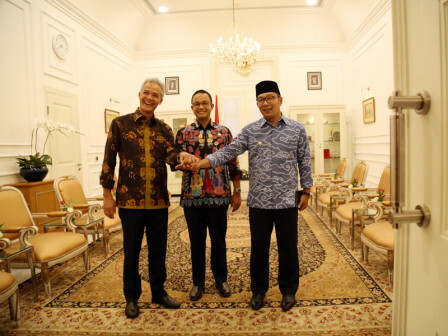 Jakarta Governor, Anies Baswedan, invited the Central Java Governor, Ganjar Pranowo and West Java Governor, Ridwan Kamil, popularly known as Kang Emil, to visit the Jakarta City Hall. "I am happy today since it is hosted by Mr. Anies "
The moment was seen after they attended the 2018 Public Information Openness awarding ceremony at the Vice President's Palace. Based on beritajakarta.id, they looked so familiar when talking together while enjoying the food and drinks. Anies disclosed that his friendship with Ganjar and Emil has been established for a long time. Today's meeting was hoped to make the atmosphere in Indonesia more peaceful and calm. "With Kang Emil we have served together. Talk about Mr. Ganjar, I had known him since college," he expressed, Monday (11/5). "I am happy today since it is hosted by Mr. Anies. This can show how calm the country with friendship," he exclaimed. He assessed that this meeting could be a rare opportunity. "The meeting is also filled by stories while s till in the movement first," he told. Similar statement also came out of West Java Governor, Emil. "The public must be cool like the smile of us. Hopefully the spirit of us can represent Indonesia better," he said. He added that friendship could bring positive things including work. It could be proven by the achievement of being a province that has information that can be accessed by the public very well. "We show that we can give the best for the Republic of Indonesia. Hopefully it will be accepted by the community," he said.